My Mount Rushmore of Beer – Let’s Crash This Party!! I woke up this morning to find that, one, we didn’t get all the snow we were supposed to get last night (we’re getting it now), and two, several of the blogs I follow are posting up articles on who they would put on a personalized Mount Rushmore for beer. I didn’t get an official invite to participate, but that’s fine by me because as I’ve said in the past, homework assignments and deadlines don’t play well here at tDoB and most importantly, I love to assume the role of party crasher. So with that in mind let’s do this. Pick four people (Rushmore only has four heads) that you think best deserve to be immortalized in the side of a mountain because of their contributions or personal influences to the category selected. Argue for hours. Truth, my friend Lisa and I went round and round one night when we did the Mount Rushmore of rock music. How one decides whose mug should be immortalized is totally up to the individual. Some take a holistic/historical perspective and some take a very personal approach and others sprinkle in a little of both. There’s really no wrong way to do this exercise, it’s purely personal, but if you do it in a setting where multiple people can chime in, the resulting debate can be quite fun, and sometimes quite heated. Which is why it pops up on talk radio quite frequently. So with all that said, how am I going to approach this? 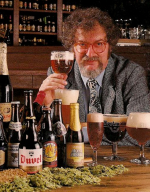 While I respect the nods that will no doubt go to the historical side of the spectrum, or to those who have furthered the knowledge and understanding of beer in general, I think for the purposes of this post I’ll pull the scope in a bit and pick four people who had an impact on me personally when it comes to beer. So let’s do this. 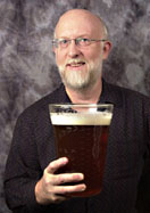 Pete Slosberg – Pete was the titular brewer/producer of Pete’s Wicked Ale, a beer that I’ve commented on several times in the past as being my “gateway” beer into the craft beer world. 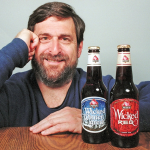 When Wicked Ale hit the shelves, it wasn’t just another craft beer in a bulging arena of craft beers, no it just about the only one. Samuel Adams had a few years head start, but wasn’t yet a common beer on the market and Anchor was still years away from coming over to this side of nation, and when it did, it wasn’t something you saw in every liquor store. Now, while I grant that depending on where you live, this bust could easily fall to someone else, for me it goes to Pete, not only for being someone who helped get this whole craft beer thing rolling, but for also showing me that “better beer” didn’t necessarily have to be Bass, Heineken or St Paulie Girl. Randy Mosher – Honestly, all the way up to the time I started to write this part, this spot on the mountain was going to go to Charles Papazian, and with good reason. Charlie was a troubadour for home brewing back before it was even legal to do so (thank you President Carter) and the seeds this modern day John Barleycorn sowed grew into mighty things like the Home Brewers Association, The Brewers Association and the GABF. When a large portion of brewers to enter the professional ranks say that your book was the first one they read when they got into brewing to begin with, that’s an almost unmatchable legacy. And I was one of those multitudes. Just like many others my age, many of my first batches of home brew came from Charlie’s book. But sometime later I picked up Randy’s book, The Brewer’s Companion and things just escalated for me. Randy brought a lot of science to the forefront of his approach to brewing, taking into consideration things like wort concentration, and time efficiencies when it came to hop extractions. If you think of this whole home brewing thing like the Food Network channel, Charlie was definitely Emeril, the man who made it popular and a part of many peoples lives. While Randy would be Alton Brown (but with far less reliance on sock puppets) bringing a certain level of science and explanation as to why things happened the way they did in your wort. And I’m not going to lie, part of my fondness for Randy is from having had the pleasure of meeting him and talking brewing at length at the 1996 Real Ale Festival in Chicago. Marty Haugh – This is a pick’em when you consider why I’m selecting Marty, but I feel justified in going in this direction. Many people who know of Delaware in the beer world associate us with Dogfish Head and by association Sam Calagione. Many people credit Sam with being a maverick in the beer world and a founding father of the growing small brewery community here in Delaware, and I certainly will not take ANY of that away from the man. But there’s a common misconception that he did it alone, and just as that story is as engraved in history as say, “The Midnight Ride of Paul Revere”, some of it isn’t quite accurate, and the tale certainly doesn’t tell the whole story. While Sam was instrumental in getting commercial brewing laws started in Delaware, the state still had nothing in the books to cover this new thing called a microbrewery (Sam was opening a brewpub) and when Marty Haugh wanted to open Rockford Brewing in 1995, it was he who worked to get the laws in place to allow such a facility to operate in the state of Delaware. I wish Marty’s story was as prosperous as Sam’s is, but unfortunately all of Marty’s hard work was for naught for him personally. People at that time were still a little dubious about this new microbrewery phenomenon, and in truth many that tried to open around this time closed, and sadly that ended up being the fate of Rockford in 1998. But, even though he wasn’t able to capitalize on his efforts, many breweries that followed in his footsteps like, Evolution, 3rd Wave, Twin Lakes, Mispillion, Blue Earl Brewing, Bellefonte, Crooked Hammock, and yes, even Dogfish Head should all give a hearty toast to Marty with the first glasses of beer that flow from their equipment. So now we get to the last face on my mythical mountain, and if you’ve ever played this game before you know that the last one can always be the toughest. You’re out of wiggle room, and probably have a handful of contenders that could easily make the cut because let’s be honest, no matter how you approach this exercise there are tons of people out there who should be recognized for their amazing contributions to the beer world (including if we can be honest Adolphus Busch). And I’ll admit I did have to toss this around in my head a while, but once his name popped into my mind, my Rushmore was complete. Michael Jackson – Jackson’s book, The New World Guide to Beer isn’t just the bible of beer styles, it’s the Rosetta Stone, pulling beer jargon and descriptions from all of the world and allowing people to pull them together into one common lexicon. It’s a beautiful and wonderfully written book from a time when bookstores didn’t have a dedicated “Beer” section. And while there are now multitudes of books out there covering the same subject, there is huge consideration in my mind to being one of (if not the) first, and I still would recommend his book as required reading to any new beer lover. That would be enough alone to warrant inclusion onto my mountain, but that’s not the total breadth of Jackson’s impact on the beer community. And for many notables out there, that wish came true. And although for many others, they didn’t get their full wish, Jackson’s works still inspired them to put pen to paper, or fingers to keyboard, to write about their passion for beer, at whatever level they can. Myself included. After all, when I wrote my Apocalyptically Doomed Beer Adventurer series, I named him Michael for a reason. So there you have it, the four faces to reside on my personal beer Mount Rushmore. As I stated above, this is a purely personal exercise, and by participating in it you have to concede that you’ve omitted many people who may have had a much bigger impact in the beer world, either from someone else’s perspective or in truth. Who would you put on your personal beer Mount Rushmore? Leave me your list in the comments below or if you’re a beer blogger/writer, do what I did and crash the party. Rushmore of rock? Making a Rushmore of *guitarists* is hard enough.